We’d love your help. Let us know what’s wrong with this preview of Mabel of the Anzacs by Mary D. Brooks. Two women - one a fiery teenager, the other a cantankerous octogenarian - find their mutual antipathy blossoms into an unlikely friendship in this heartfelt multi-generational story about finding a kindred spirit where you least expect it. Zoe Lambros meets Mabel Andrews, a mercurial, cantankerous World War I Australian nurse. Zoe's introduction to the fiery octogenarian i Two women - one a fiery teenager, the other a cantankerous octogenarian - find their mutual antipathy blossoms into an unlikely friendship in this heartfelt multi-generational story about finding a kindred spirit where you least expect it. The Intertwined Souls Inbetween Series are standalone novels of the award-winning Intertwined Souls Series. This novel - in the timeline of the series - sits between Where Shadows Linger (Book 2) and Hidden Truths (Book 3). To ask other readers questions about Mabel of the Anzacs, please sign up. If you followed the Intertwined Soul Series, you will want to read this book. If you didn’t follow the series, you will still want to read this book because the characters are so memorable and likable. In this story, Zoe is 18 years old and living with her soulmate, Eva. She is still obstinate, loud, funny, and very opinionated. When Zoe meets 80 years old Mabel sparks fly… but not the good kind…angry deadly sparks. However, once both parties meet and actually talk, they discover, surprisingly, If you followed the Intertwined Soul Series, you will want to read this book. If you didn’t follow the series, you will still want to read this book because the characters are so memorable and likable. In this story, Zoe is 18 years old and living with her soulmate, Eva. She is still obstinate, loud, funny, and very opinionated. When Zoe meets 80 years old Mabel sparks fly… but not the good kind…angry deadly sparks. However, once both parties meet and actually talk, they discover, surprisingly, many similarities and connections between them. One aspect of this story I found most interesting was the role of women during the war as described by Mabel, who was a nurse during WWI. They were often the unsung heroes... and liked it that way. History books sing the praises of the generals, but this historical fiction story looks beyond those men to the nurses, doctors, and members of the resistance who made a difference with heroic deeds, often resulting in their own deaths. This was another great story by Ms. Brooks. It was funny at times, quite sad at some points, but always very interesting. As with the author’s Intertwine Soul Series, the relationship between Zoe and Eva continued to be the truest sense of a partnership-both supportive and loving-a testament to what love should be regardless of gender. Although not ‘labelled’ as an Intertwined Souls book this is really part of that series and goes back to the days when Eva and Zoe were getting established in Australia. It is very much a ‘Domestic Drama’ without any violence or any of the paranormal incidents that came into some of the later books. The story is centered around Zoe’s relationship with Mabel, an eighty year old ex-nurse, who owns the apartments that Eva and Zoe rent. In the main it was a very enjoyable read and the only reason I d Although not ‘labelled’ as an Intertwined Souls book this is really part of that series and goes back to the days when Eva and Zoe were getting established in Australia. It is very much a ‘Domestic Drama’ without any violence or any of the paranormal incidents that came into some of the later books. The story is centered around Zoe’s relationship with Mabel, an eighty year old ex-nurse, who owns the apartments that Eva and Zoe rent. In the main it was a very enjoyable read and the only reason I didn’t give five stars was towards the end of the book it became a bit over sentimental for me. I was lucky enough to have been given the opportunity by NetGalley to read Mabel of the Anzacs by Mary D. Brooks in exchange for an honest review. As the story began, I didn't think it was going to keep my interest but was I wrong. It did take a while for the story to develop but once it did it had my attention and I found it hard to put down. Mary D. Brooks portrayed the characters of Zoe, Eva and Mabel as believable and very human. Mabel of the Anzacs began shortly after the end of World War II I was lucky enough to have been given the opportunity by NetGalley to read Mabel of the Anzacs by Mary D. Brooks in exchange for an honest review. As the story began, I didn't think it was going to keep my interest but was I wrong. It did take a while for the story to develop but once it did it had my attention and I found it hard to put down. Mary D. Brooks portrayed the characters of Zoe, Eva and Mabel as believable and very human. Mabel of the Anzacs began shortly after the end of World War II in Australia. Zoe and Eva, sole-mates and totally in love with each other, were sharing a flat. Zoe, not quite 19 years old, was impulsive and always talking too much. Whereas Eva, was shy, practical and always in control of the situation at hand. They totally complimented one another. Their love for each other was beautiful and pure. Mabel Andrews, one the other hand was an older woman who lived on the ground floor of the apartment complex where Zoe and Eva lived. Zoe and Mrs. Andrews were constantly butting heads. Mabel Andrews' prized possession was her flower garden including her prize worthy azalea bushes. One day Zoe accidentally ran them over when her bike crashed into them. Mabel Andrews had it out for Zoe. She decided that she did not like the girl and even called her a snot. As many times as Zoe apologized to Mrs. Andrews for what she had done to her garden, Mrs. Andrews could not let her anger and dislike for Zoe go. Then a few days later, Zoe received a written invitation from Mabel Andrews to come to tea. The result would be life changing for both Zoe and Mabel Andrews. 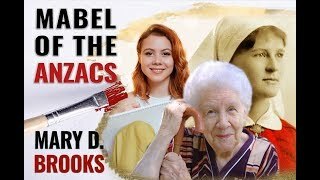 Mary D. Brooks' s book, Mabel of the Anzacs explored the difficult and often unrecognized valor and bravery of nurses during World War I along with unconditional love and friendship. As Zoe and Mabel got to know one another and revealed deep, hidden and painful secrets, they developed a new understanding, love and friendship toward each other. To Mabel, Zoe was an annoying, childish snot who wasted her time reading romance novels and drawing before she got to know her. To Zoe, Mabel was a crotchety eighty year old woman who did not like her and was extremely mean and uncaring before she got to know her. As their secrets were shared they discovered what they saw on the outside was well camouflaged by what truly existed within them and in their hearts. What a journo reunite with Eva and Zoe.The most incredible couple ever created.The supporting cast of the Intertwined Souls series has always been top notch and adding Mabel only raises the bar. What a great character!How I wish she had stayed longer.This book fills in some unanswered questions and the answers were quite wonderful. I recommend to every one who loves books to read this series.One cannot help but love it.Start at the first and take your time.It will be time well sp Truly wonderful. I simply loved the characters of Mabel, Zoe, and Eva! The Intertwined Souls series by Ms. Brooks is unfamiliar to me, but I will be on the look out for copies of these entertaining, well-written books. Historical fiction at its best in this post Australia WWII novel. This book was funny at times, sad at others, but always held my interest thanks to the author's great writing, characters that I felt invested in, a plot that I enjoyed, and the setting of being during World War I. Highly recommend this! It was nice to see our favorite characters, Eva and Zoe from the Intertwined Souls series, as well as minor characters and to catch up with Eva and Zoe after their immigration to Australia three years after the war. I love reading historical fiction, and this one really interested me because a lot of the historical facts in this story involved nursing during WW 1. Mary D did a great job integrating fictional characters and their story into a fascinating period in history. This was personal for m It was nice to see our favorite characters, Eva and Zoe from the Intertwined Souls series, as well as minor characters and to catch up with Eva and Zoe after their immigration to Australia three years after the war. I love reading historical fiction, and this one really interested me because a lot of the historical facts in this story involved nursing during WW 1. Mary D did a great job integrating fictional characters and their story into a fascinating period in history. This was personal for me because my mother was a nurse and my aunt was a nurse in WW 2, achieving the rank of lieutenant. My aunt probably did many things in her service as Mabel did as a nurse in WW 1. I am giving this book four stars instead of five, not because of the content of this story but during the first half of the novel, I found several grammatical errors that took me out of the reading zone I was in. The story itself though is worth overlooking the errors. This is one of the rare books I have come across where the publisher's synopsis appears to have been written by someone who has not read the book. I say this for two reasons. Firstly I had no idea that the ANZACS named in the title actually stood for the Australian and New Zealand Army Corps (ANZAC) which was a Mediterranean Expeditionary Force that operated during WWI, especially during the Battle of Gallipoli. I am excusing my ignorance due to the fact that I was born and raised a Canadian wel This is one of the rare books I have come across where the publisher's synopsis appears to have been written by someone who has not read the book. I say this for two reasons. Firstly I had no idea that the ANZACS named in the title actually stood for the Australian and New Zealand Army Corps (ANZAC) which was a Mediterranean Expeditionary Force that operated during WWI, especially during the Battle of Gallipoli. I am excusing my ignorance due to the fact that I was born and raised a Canadian well after both World Wars were over. The second major issue that I have with the synopsis is that I was not forewarned that the novel features a lesbian love story as a central plot device. But I do not hold Mary D. Brooks responsible for the oversights of her publisher. 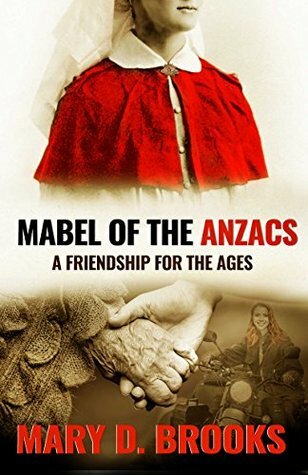 Mary D. Brooks demonstrates a keen knowledge of the ANZACS in her novel, Mabel of the ANZACS: A Friend for the Ages. Her narrative technique focuses mainly on conversations between her fictional characters and thereby lots of the excitement and suspense of the story line is lost since we know everyone is alive and well as they are reminiscing about their adventures many years later. Not since I first read Victor Hugo's Les Miserables have I encountered a story with as many coincidental meetings between various characters, something I always feel is a cop out by an author.